The Frick’s visitors deserve amenities that match the superb quality of its collections. To this end, the plan features amenities and enhancements for better visitor circulation and ADA-accessibility throughout the Frick. 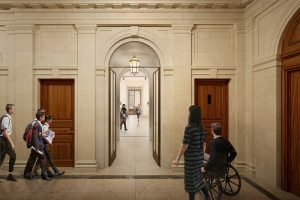 Visitors entering the Frick through the original 1930s museum entrance on 70th street will experience improvements to circulation inside. From the 1935 Beaux-Arts entrance hall, visitors will move into the reception hall, which will be reconfigured to streamline the flow of guests through the main admissions and information areas. This room also will offer seating and views of the 70th Street Garden, designed in 1977 by Russell Page. Improved coat check facilities and restrooms will be located below ground level, accessible via a pair of new ADA-accessible elevators. The reception hall will provide access to a new upper-floor lobby by elevator or an elegant new staircase, a nod to the signature Grand Staircase in the 1914 portion of the building. On this upper level, the public will be able to enjoy a contemplative seating area with another view of the 70th Street Garden, museum shop, and the institution’s first café. Beyond these amenities, the public will gain access to a suite of rooms on the second floor of the original Frick residence, which will be transformed into galleries. In addition new ramps will be introduced at the public entrances to the museum on 70th Street and to the library on 71st Street, where there will also be an entrance for school and other groups. The design will also create a public passageway linking The Frick Collection and Frick Art Reference Library, enabling visitors and students to move easily between the buildings for the first time without having to exit the institution.